On Friday the New York Times published a bizarre story about Deputy Attorney General Rod Rosenstein. The article alleged that Rosenstein had floated a suggestion to secretly record Donald Trump to gather evidence of his mental infirmity. There was reportedly further discussion of invoking the 25th Amendment to declare the President incompetent and remove him from office. That hardly seems like an allegation that needs any additional proof. It looked like Trump was getting the support he would need to fire Rosenstein from a bevy of Fox News hacks. They included Laura Ingraham, Gregg Jarrett, and Jeanine Pirro. But all was not as tightly synchronized as one would expect of the Fox propaganda machine. 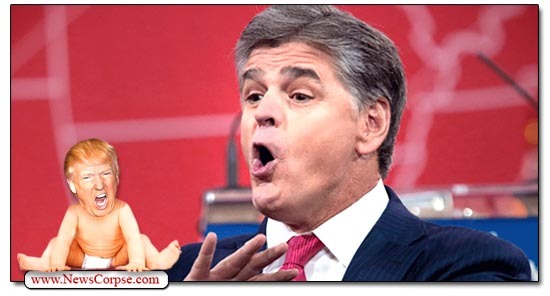 Later that evening when Sean Hannity’s program came on, he had a decidedly different take on the matter. He looked squarely into the camera and delivered a personal message to Trump saying “Under zero circumstances should the president fire anybody. The president needs to know it is all a setup.” Hannity asserted that the whole thing might be an insidious attempt by the “deep state” to bait Trump into firing Rosenstein and then initiating impeachment proceedings against him for doing so. So now we have achieved the full hive-mind harmony that is required of a socio-political cult. This unanimity of viewpoint makes it possible for the borg Family to advance their robo-mission unencumbered by independent thought. And surprisingly, the leader of the Family has remained silent. Trump has not addressed the Times’ article directly since it’s publication. He did make a sideways reference at a rally that simply accused his Department of Justice of having a “lingering stench.” Which is something that, were he more self aware, he would realize was emanating from himself. But for the time being, Rosenstein’s job is safe due to the paranoid musings of Trump’s State TV (aka Fox News). Perhaps the high level of paranoia of the bat crap crazy Republicans, is about to bear fruit. THIS is why I hate the NYT and never read it. I stopped my home subscription years ago and I’m so glad that I did. This traitorous rag sheet can NEVER be a go to source for accurate political information- Why? Because the NYT always seeks to play both sides of the political game board. EVERY election season about 30, 40 or 50 days before the general election, the so called authoritative NYT will come out with a slew of negative articles about the Democratic candidate that could undermine that person’s campaign. This was done with Al Gore, John Kerry, Barack Obama, Hillary Clinton. Or they will cover the Republican candidate more than the Democratic candidate like they did in 2016 by covering everything- trump and constantly highlighting HR Clinton’s email “problem.” Here we go again, less than 2 months to Election Day and the NYT using an incident that their “anonymous sources” claim happened in 2017, are acting like some snarky sarcastic comments that Rod Rosenstein made in a meeting are treasonous and designed to topple who? The fake president who actually stole the 2016 election with Russian help, broke every election regulation in doing so, who still lost the popular vote by nearly 3 million people, and who has clearly shown himself to be an enemy of American Democracy? Why would they roll out this story NOW a year later after they claim it occurred to help trump? People need to stop giving journalists at the NYT credit for being such objective knowledgeable professionals because they are showing just the opposite. M Haberman, P Baker, et. al. will sell the American people out and run like a republican dog after a bone to help trump and his corrupt regime. People need to stop looking to the NYT as the most credible source of political information and current news. They aren’t and have their own agenda- In my opinion, it isn’t to help the American people wrest back control of this country from the putin-republicans.